Today, Xperia Tablet Z booted into CyanogenMod 13 for the first time. Many things still broken, but it is a start! As of today, all Sony Xperia devices based on the Fusion3 board (Xperia Z, ZL, ZR, Tablet Z, Tablet Z WiFi) are getting official CyanogenMod 12.1! When I first started looking at these devices in December 2014, the CM12 source code would not even compile, let alone boot, and even the recovery was broken. Well, here we are, hundreds of commits and quite a lot of annoyances later: F2FS is now supported, a plethora of kernel changes and the new BFQ scheduler made the user experience better than ever, the latest proprietary blobs are integrated, SELinux is properly set up, and a ton of reorganization and cleanup has been done – for all of Sony’s MSM8960 devices and beyond. Still many things to do, but for today, I’m lighting a cigar! If you have one of these devices, check out GET.CM and give it a whirl. There is a truly fantastic team of developers at Cyanogen and CyanogenMod, and without them, none of us could enjoy mobile computing quite like we do. Starting with early March 2015, CyanogenMod for the whole original line of Sony’s Xperia Z devices support F2FS, a filesystem optimized for flash memory. Tests have shown it to outperform the default ext2/3/4 that we used previously, so definitely a nice thing to have. However, if you want to benefit from F2FS, you need to manually convert your phone. Be aware that this needs some understanding of how to use ADB and the conversion process will DELETE all you user data/settings! First, you need to have CyanogenMod 12 or higher installed on your phone, and be using the official recovery. Also, you need ADB installed and ready to use on your computer. After a long development phase, Xperia Tablet Z and Xperia Tablet Z Wifi are now on the official nightlies list of CyanogenMod 12.1, not least thanks to testers on XDA and generous donations. The list of improvements since CM12 is immense, with a load of kernel updates that makes these devices as smooth and fast as they have never been on CyanogenMod. In January, I’ve been added as a device maintainer for Sony’s fusion3 platform on CyanogenMod. That platform includes the original Xperia Z line of devices (Z, ZL, ZR, Tablet Z, Tablet Z Wifi). Most of my work went into the platform and the 2 tablets, since I actually own one of these. 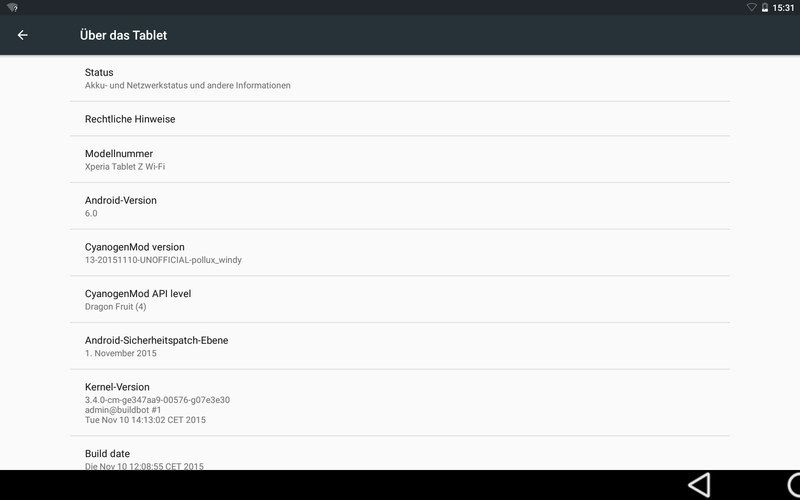 By now, I greenlighted the tablets for CM12, and they are now official CyanogenMod nightlies. , they are my main target of development. The phones will trail a bit, since I need to rely on others to test fixes and features for me, mainly through a thread on XDA. Thanks to Peter Hutchison, who has been working on the help file for an unbelieveable 12 years already, you can now find version 2.2.7 in the download section! Cherish your old satnav, despite it being a bit slow? Have map updates you want to transfer over, but it takes 14 hours or more to complete? Here is a hint: stay away from USB3 ports, that should speed up the transfer… Way to go, TomTom (One, XL). Checkpoint switched the platform for their security products from SecurePlatform to Gaia. Sooner or later, a switch to Gaia will be necessary… Well, there are plenty of documents about this topic out there. Rejoice, people, one follows right here – valid for small installations (standalone boxes, really). First of all, you want to get the current configuration from your box. You need to understand that this consists of 2 parts: the OS level configuration (interfaces, routing table) and the CP database (rulebase, CP settings). Checkpoint provides tools for the latter, but not for the latter. Almost done! Now, connect to the box via your newly installed SmartDashboard, and install the rule database. Only after that step will the rules be enforced! Note: depending on how you perform the switch over to the new platform, you might get a ton of “TCP packet out of state” errors. In that case, you might want to go to general options -> stateful inspection, and disable the “drop out of state packets” for the first couple of hours of operation.